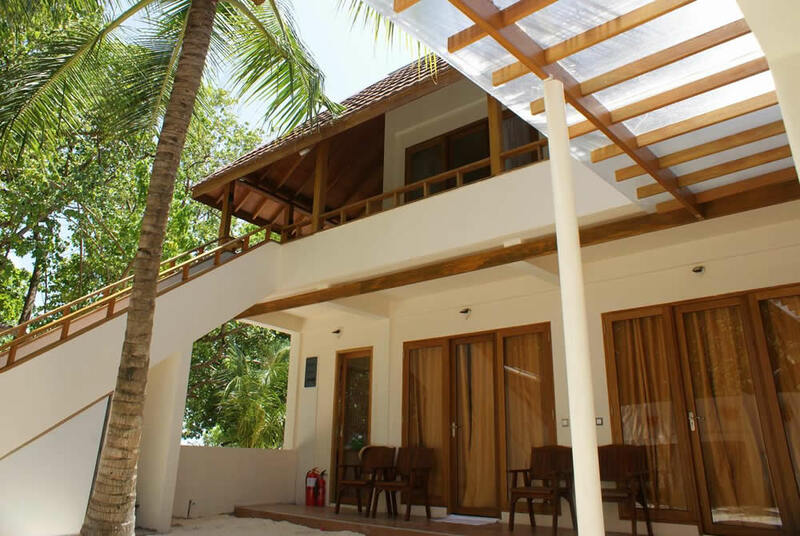 Hangnaameedhoo is one of the inhabited islands of Ari Atoll (Alif Dhaal Atoll) for a great budget holiday in the Maldives. Swimming in crystal clear waters, house reef snorkeling, fun diving and relaxing on the private beach is the stuff that Hangnaameedhoo is made on. Finding just a little more than an hour by speedboat from Male, the idyllic island blessed with its pristine white sandy beaches and vibrant, untouched coral reefs, and thanks to the cheap accommodation, an attentive staff, great food and exciting water adventures you'll get the ultimate Maldives island holiday experience but, happily, without the prices of luxury resorts. The Maldivian island life and serenity of Hangnaameedhoo with unique features is away from the five-star hotels and beyond luxury hideaways, and now you can have an interesting, real cultural adventure in the exotic Maldives islands for a fraction of resort costs. You will have real chance to live as a local in the community, to know more about Maldivian lifestyle and watch the comings and goings of fishing island village life. Therein lies the charm of the place, it really feels like the real Maldives. Expect a fantastic services, a wide range of facilities and superior qualities complemented by service standards that reflect the varied and discerning needs. Hangnaameedhoo island is located in South Ari Aroll/Alifu Dhaalu Atoll of Maldives. 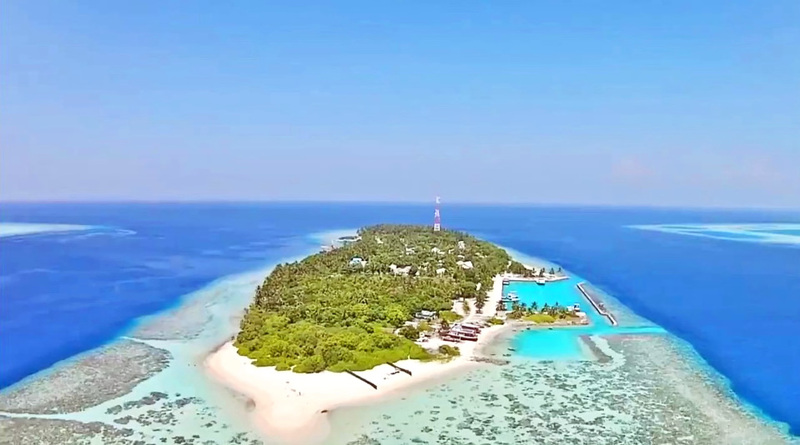 Traditionally the atoll was named as Ari Atoll and Hangnaameedhoo is the most nearest (71 km) inhabited island of south Ari Atoll to capital Malé and Velana International Airport. 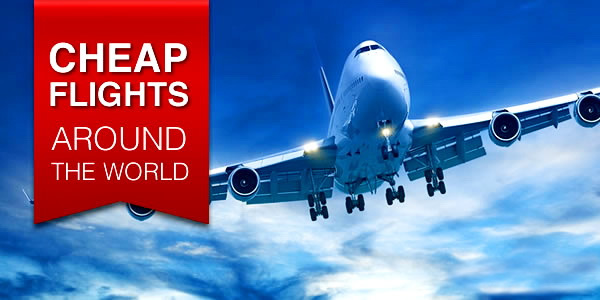 Expect a staff member on arrival to meet you at the airport. He makes sure you get on the correct speed boat that they arrange when that time comes. The speedboat transfer from Male' to Hangnaameedhoo Island normally takes 1hr 15mins and costs 30USD per person one way. For speedboat reservations, please contact your guest housel for further details. Upon request the guest house can arrange private speed boat transfer ( USD 750.00 one way, 10 passehnger capacity) between Velana international airport (VIA) and Hangnaameedhoo and price will advise while confirming the booking. There is no ATM on Hangnaameedhoo, so please stock cash in Malé. Even though the hotels do accept card they charge a 6% service fee so bring cash! You can coordinate the traffic schedule and the transfer type in advance with the staff of your guest house (recommended), or check here. Oriented from west to east and with total population is just 700 souls, Hangnaameedhoo is approximately 1 km in length and 225 meters in width. Since 2014 the island developing for local tourism with a dozen guesthouses. This island is litter strewn in some places but the guest houses and their grounds are super clean and mostly right next to a beach. Since Hangnaameedhoo is a local island, an appropriate dressing is required in the island. Commonly acceptable dress code in the island include shorts, t-shirts, shirts, sleeveless t-shirts, vests, vest tops, jeans, pants and other casual clothes. Bathing Suits like bikini is not allowed at anywhere in the island except for private/bikini beach. Transparent and seethrough dresses are also not allowed at anywhere in the isalnd. There are two schools, Magistrate court, health centre 24/7, a pharmacy, dock yard, play ground, shops & groceries, souvenir shops, cafes, police, mosque and football field on the island. Walking in island you will find local shops to buys some personal stuffs and local craft shops to buy genuine "Made in Maldives" wood carving and lacquer works. Calls and prayers in the mosque (several times a day) should not annoy you. There is also a boatyard on Hangnaameedhoo en route to the beach which is messy but much less industrial than larger islands and seeing the boat builds take shape every day is fascinating. During your stay you can visit habour area where you will be greeted by local fisherman with their catches. If you would like to have fresh fish for your lunch or dinner your hotel's chef can made it just for you. Your meals can be made spicy or mild, depending on your tastes. Yes to some extent there are mosquitoes in the island but they bite on schedule: in the morning from 6 to 7, in the evening from 5 to 6, that is, at twilight hours. If you are particularly sensitive to mosquito bites then it is recommended to use a mosquito repellent which is available at the hotel or from convenient stores. However, no mosquitos inside the hotel or your room. As for the fauna, there are crabs, hermit crabs, lizards, herons, ravens, flying foxes on the island. Hangnaameedhoo is a tiny charming island where you can experience the real Maldives life. Being on an island you'll are lucky to get a chance to see Maldivians true culture and traditions by yourself. The locals are really friendly by nature, they are always happy to help their guests. Although they live at the same island, your holiday would not be interfered by them. The main land marks of the island Hangnaameedhoo are the Shrine of King Ibrahim Kalaafaanu Trditional mosque, old Banyan tree and the tombstones. All sights are in the heritage list of the country and a great locations for the tourists to visit and capture their memories. Hangnaameedhoo island is well known among the atoll for its beaches and leafy, sandy tip. The white sand tip and the bikini beach is just 5 minutes walking distance from your doorstep. You are so lucky that the tip is facing the west with an amazing sunset every day. The bikini beach it cleaned up with chairs, loungers, and hammocks to relax which is really nice. Here you can swim, sunbathe and snorkel in a bikini. There are also a nice sands on the island's east part, but these are public beaches and here you must adhere to the dress code. A few good tips: bring a thin wet wetsuit with osba - it will save you from sunburn and will allow you to move freely around the island, because in a bikini you can swim only on a bikini-beach; use coral slippers; Be sure to use sunscreen in any weather, even if it is overcast. Ocean Beach Inn has a it's own private beach - a very beautiful area with swings, a hammock, sun beds and umbrellas. 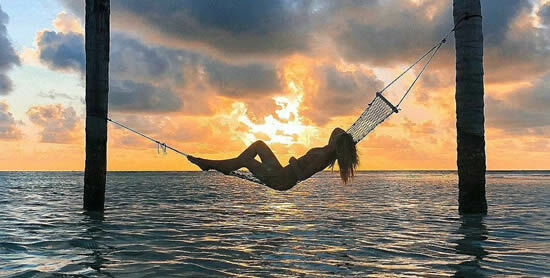 A special pleasure in the evening before bedtime is to swing on a swing, listening to the sea and looking at the stars. The waters are rocky, but here the house reef is closer to the shore and the best for snorkelling. Located in the channel, Haangnamedhoo island has an incredible house reef that's teems with abundant marine life and where you can do the snorkeling at anytime. 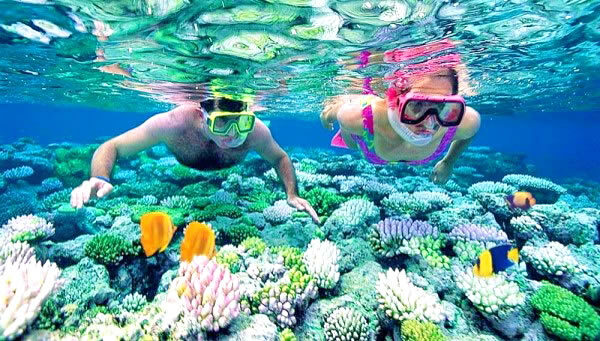 An easily accessible, the house reef is excellent for snorkeling with a large shallow lagoon with lots of coral fish nurseries. The drop off is not far from the beach and you can spot black and white tipped reef sharks, rays, giant moray eels and turtles every day as well a octopuses, eagle rays, lionfish, barracuda and if you lucky a stonefish and a pelagic species. The most guest houses has fins, masks, and snorkels that can be used for free. The Ocean Beach Inn has the best location because the house reef is just a few steps from the beach for snorkelling. Scuba diving in Ari Atoll is relaxing, adventurous, sometimes challenging, and always stunning. With white sandy beaches and crystal clear waters, many divers rate Ari Atoll's sites to be the best in the country. Atoll's dive sites are rich with marine life. Diving in Ari Atoll is not known for the brilliance of its corals. Rather, divers choose these waters for regular discovering pelagic species, including whale sharks, hammerheads and mantas. The hosts are very friendly and always happy to help, all the usual excursions are available at reasonable prices. There are many activities which are available that include visiting to picnic island, sand bank, dolphin watching, whale shark and mantas exploring, big game fishing, sailing, canoeing, banana rides, speedboat tours, snorkeling trips to the oute reefs and much more. 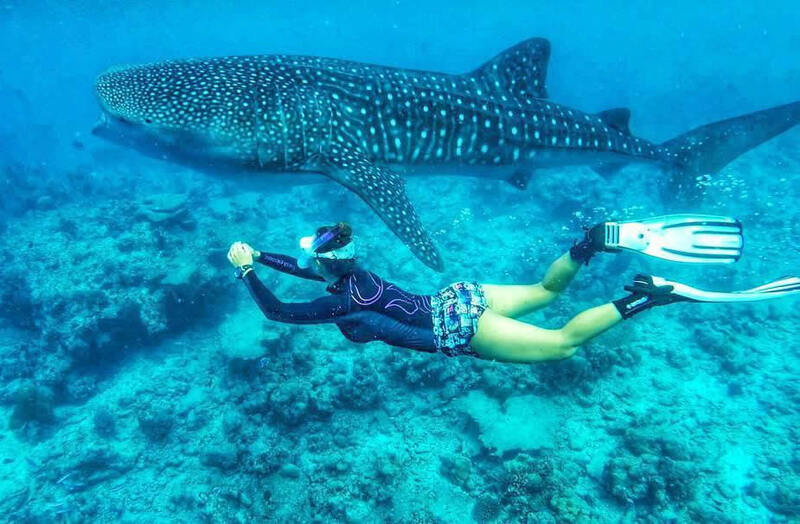 Get left on a sandbank for a day, go to a deserted picnic island or go sunset fishing, but the highlight for mostly guests is whale shark watching in the south of Ari Atoll. Although it is a two hour round trip, they have a small nimble speedboat meaning they can drop you in the right spot to see the shark, pick you up and do it again. During this journey you can also see a turtles and lots of dolphins. A line and some bait are all you need to participate in the sunset fishing experience. Catch one if you can, and a local chefs will be delighted to prepare it to your liking. The excursion takes about two hours by dhoni. Visit the overwater resort to spend high quality luxury style hours in your budgeted holiday. Like a Robinson Crusoe, visit the picnic island of Digghiri or Dream island. This is the most beautiful island in the region if you are looking for the true beauty of Maldives. Spend your day with your loved ones in this uninhabited small island. A whole day or half day (meals provided). The island is away from the local islands thus preserving its natural beauty. 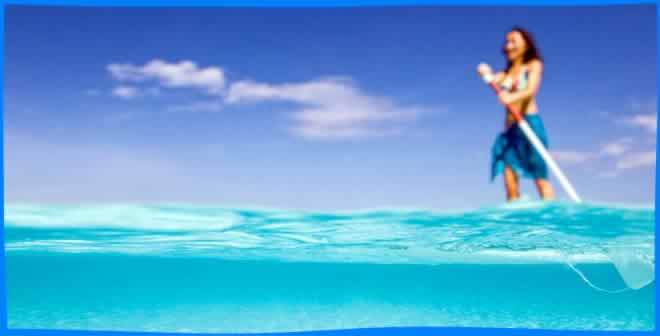 Your sunny day on a pure white sand bank with the opportunity to explore the reefs surrounded. Expect a beautiful white beaches, sea birds like white terns, green plants & colourful reef environment to explore. An amazing food with a variety of international options is simple but fresh. Your stay in guest house include free daily breakfas and you will never be hungry. With Maldivian and Continental fare, the breakfasts and dinners are really great. Always delicious freshly prepared food, rice, different types of curry, several types of vegetable salads, pastries and snacks. For dinner every day, fresh cooked grilled fish. And every day they try to serve different fish and cooked according to different recipes. Even if you are with children, they should appreciate the Maldivian cuisine. Continental breakfast (sausages, eggs, toast, butter, cheese, jam, chocolate spread, national Maldivian dish - Mas Huni Roshi is fresh roties with a tuna, coconut and onion stuffing, very tasty, some fruit, water and drink. Instant coffee, for a fee, you can use a coffee machine. Ocean Beach Inn also offers Lunch and Dinner Buffets for 15 USD/person and consist of rice, fried rice, curries, grilled fish, vegetables and desserts on the beach and it’s really memorable! 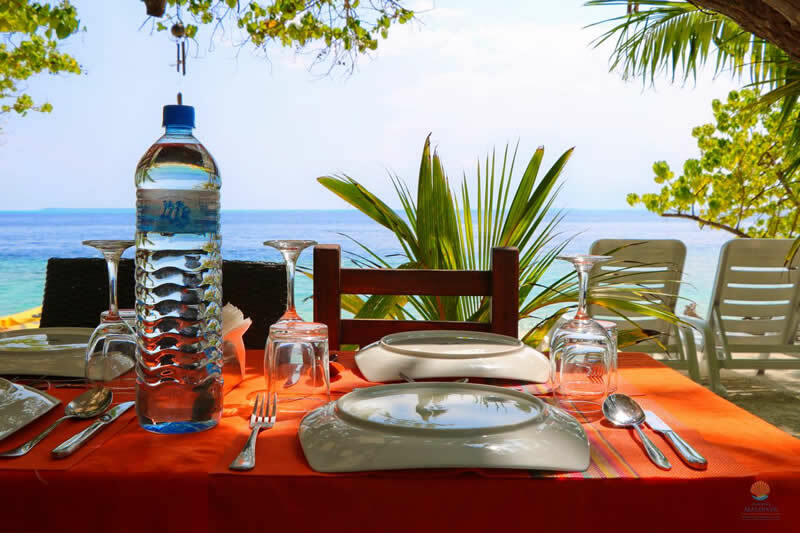 There are always fresh and tasty grilled fish, curry, beans in hot sauce, salad, fruit, dessert on the tables. From side dishes - rice, pasta, vegetables. Drink and water - unlimited (unlike resorts). Restaurant at Kalaafaanu Retreat is also good! Try a lot of their delicious food and we have to say this: the best dish is the reef grilled fish here - highly recommended! The shack at Kalaafaanu's restaurant is very cool and the hosts go out of their way to make arrangements for a nice candle light dinner every night with soothing music and great food. Also you can have a rooftop party there playing various games. If you want, for example, chicken or seafood, tell the owner. Chickens are imported so do not expect cheap and fresh chicken meat. Fruits are delivered to the island's stores on Thursdays: bananas, mangoes, papayas, oranges. In local minimarts you will find canned food, sweets, ice cream, cereals and juices. There are 3 restaurants/cafe's on Hangnaameedhoo. Roughly speaking, the cost for food is $8 breakfast, $12 for lunch, and $15 for dinner. Green Leaf Garden Restaurent is great place to have a cup of coffee and wonderful coconut cakes! Tuna sandwiches, pasta with tuna, fried rice chicken, sausages with french fries and noodle dishes! Great place for chillaxing in the evening! Great friendly service! the place is clean, you can meet the locals, the staff is very attentive and qualified. Today (2019), there are 10 guest houses on Hangnaameedhoo island that's provide luxury service at an affordable price. The rooms are super clean, no frills, a nicely decorated, with hot water and a silent AC and really comfortable beds. WiFi is fine. Can't complain really. It is a perfect accomodation for travelers who recognize that they are going to spend most of your time on the beach and ocean rather than cooped up in your room. With good English is spoken, the staffs are really friendly and fairly helpful with anything that you may need on the island including fishing, snorkeling, and other excursions. The guests are more than just passing travellers, at Hangnaameedhoo's hotels you are part of the family, and a owners take every opportunity to exceed your expectations. Overall we really rate this place. It is hard to find a good, cheap place to stay in the Maldives as the high-end sector is dominant, but you'll happy with this one.